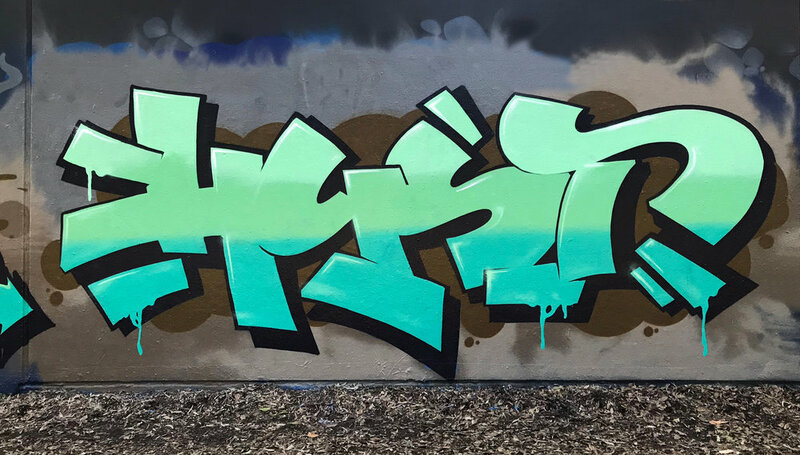 AS AN ORIGINAL MEMBER OF THE INFLUENTIAL CREW KOC WHO FORMED IN 1994, STUDDERT HAS BEEN EXPERIMENTING WITH AEROSOL TECHNIQUES AS AN INDEPENDENT ARTIST SINCE THE LATE 80S. HAVING ALSO SPENT THE LAST TWO DECADES WORKING AS AN ART DIRECTOR WITH SOME OF AUSTRALIA'S LEADING BRANDS, STUDDERT’S CURRENT BODY OF WORK SHOWCASES AN ATMOSPHERIC AND AMBIENT SERIES OF PAINTINGS SOLIDIFYING OVER 20 YEARS OF CREATIVE EXPRESSION AND EXPERIENCE. WORKING WITH A SERIES OF LAYERS OF ACRYLIC AND AEROSOL PAINT, 'THE HYST' OFFERS VIEWERS BURSTS OF COLOUR, TEXTURE AND SIMPLICITY. 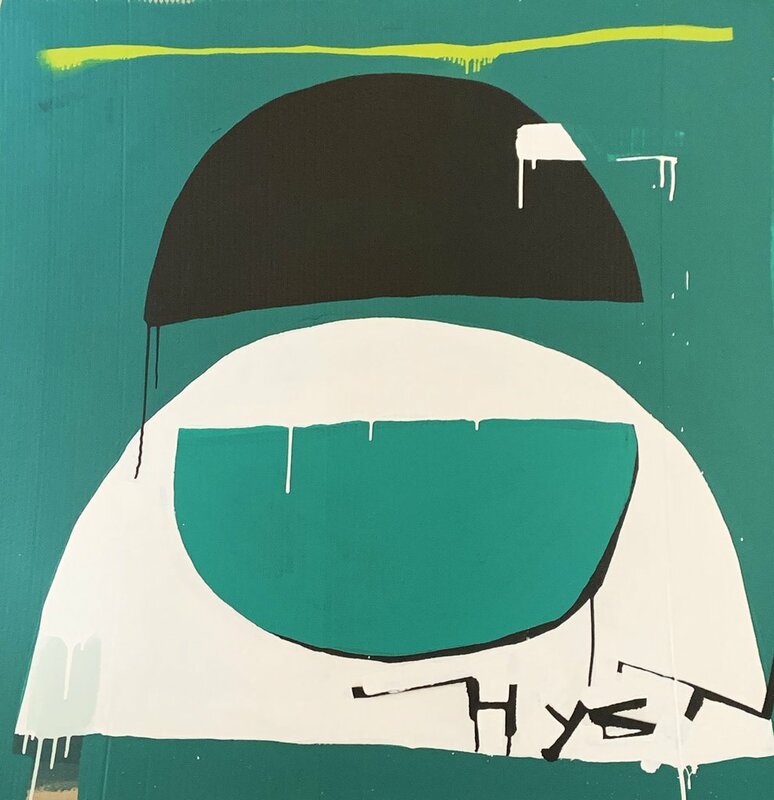 USING PREDOMINANTLY RECYCLED MATERIALS AS CANVAS’S, EACH ARTWORK FEATURES ELEMENTS OF COLOUR, LINEAR FORMS AND ICONOGRAPHY THAT BRIDGE HIS PASSION FOR GRAFFITI AND DESIGN. 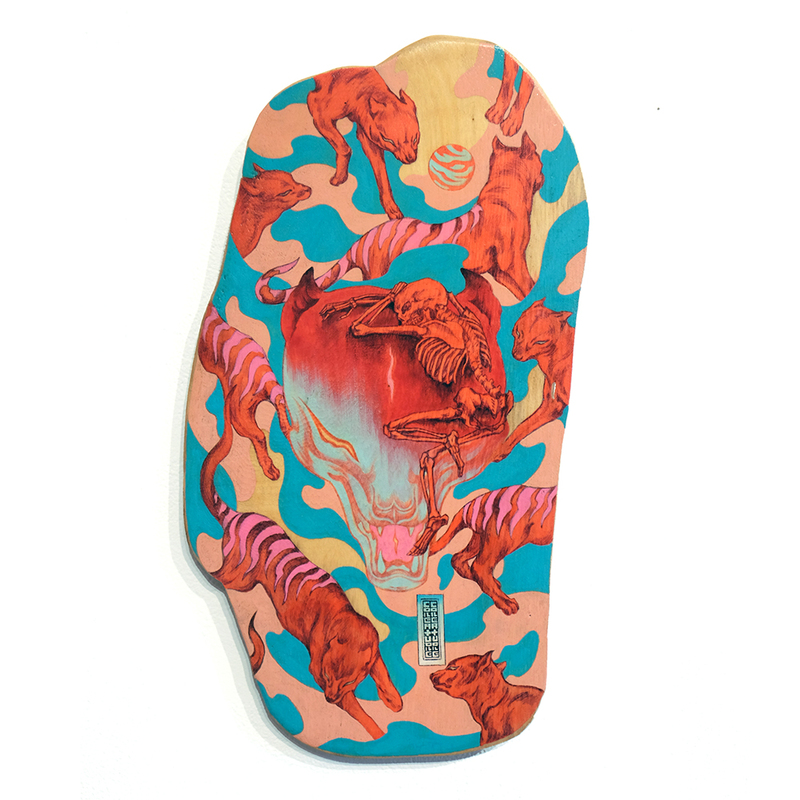 WE CAUGHT UP WITH MATT TO TALK US THROUGH HIS MOTIVATIONS AND EXPLANATIONS OF HIS SOLO SHOW. I draw, paint and design primarily because I am compelled to. When I am not working on project (regardless of discipline) I feel a sense of discomfort. I believe anxiety is an important emotion for an artist, well it is for me anyway. If something looks right – it usually feels wrong. In the mid 80's I lived in Melbourne and this is where I was first introduced to graffiti and my love of skateboard brands and graphics. Also, my father was very talented at technical drawing and model making – which furthered my interest in the idea of design as a craft. When my family moved to the Gold Coast in 1988, I felt quite different than the locals – but, it was where I met the most influential figure in my artistic life, AVSKE (RIP). Together, AVS and I learned the trade, were schooled by talented mentors and pursued our own individual styles. After graduating from QCA (Griffith Uni) in 1997, I started a small business with a mate. We were both artists more so than designers. It was important exercise for us, but we made less money than we did while we are Uni. 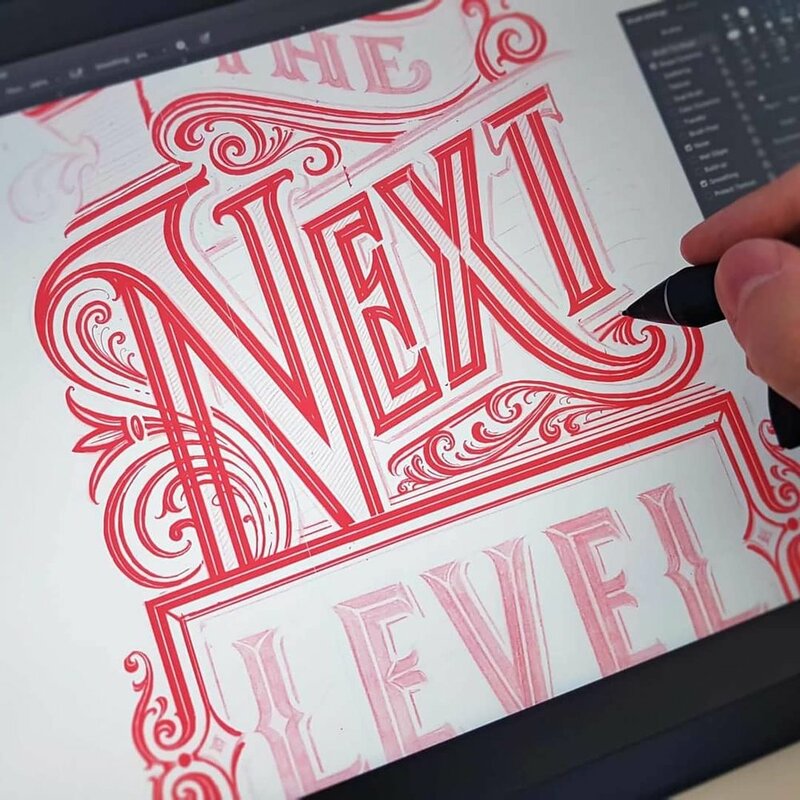 From there I followed a more traditional graphic design path, from print, advertising, design studios and then finally consulting in brand strategy. Who’re some major clients you’ve worked for? I have created brands for some of Australia's leading multi-national organisations. However, my favourite design projects are the ones that don't pay; ie: friends album artwork, artists catalogues etc. How long have you been part of the graffiti scene? As mentioned above, I instantly connected to graffiti in the mid 80's as a spectator. But then began to experiment with paint around '89. I am an original member of the influential koc crew which was formed in 1994. This was a big deal for me as the crew was comprised of artists who both inspired me then and now. In my studio work I build a series of layers, so acrylic paint works for me. I also use spray paint as a drawing tool in this process. I like to work on the materials that people tend to ignore, discarded cardboard, timber and packaging material. When it comes to graffiti, of course it is spray paint, but I am not against using brushes and rollers too. 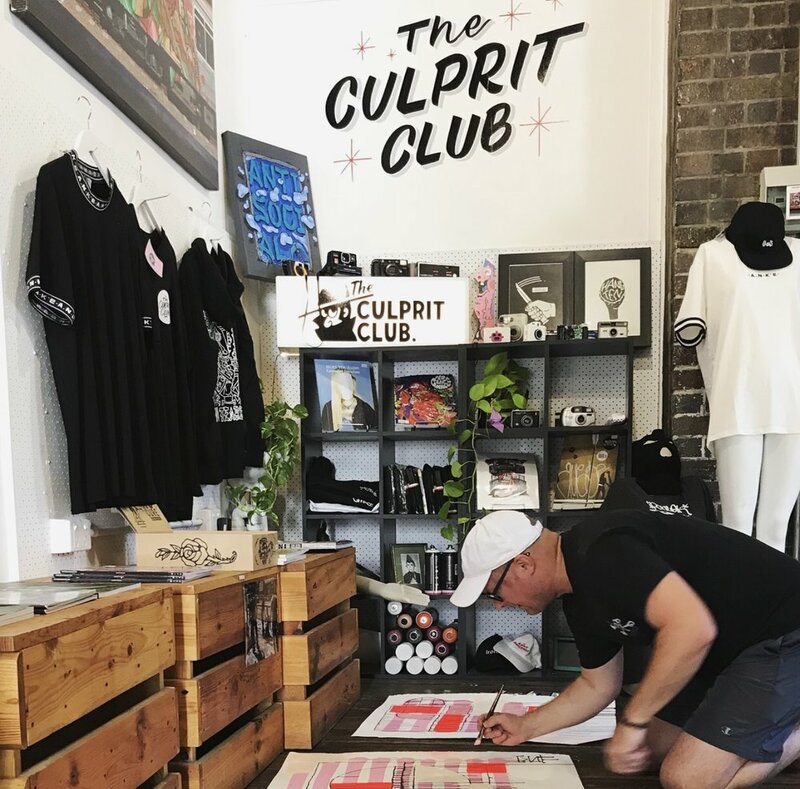 I'm really excited to be working alongside The Culprit Club on my debut, and have been working from their in-house loft studio in Winn Lane, Fortitude Valley. What do the artworks mean to you? What are their purpose? The body of work I am currently producing is difficult to articulate as I 'll try to not think about what am drawing or creating. Therefore I guess I would describe them as being somewhat atmospheric or ambient. I usually select an implement and a surface – then try to automatically produce a series of symbols, glyphs and icons. From there, it is a process of either addition or subtraction of those marks until I find satisfaction. My objective with these works is to give the viewer a moment in time where they can just forget about the noise that fills their head on a daily basis. All that static is considered normal or acceptable these days – but it shouldn't be. When someone is asked "what are you thinking about?" And they answer, "nothing" – they are judged or labelled as vague. To have nothing on your mind is very difficult to achieve. So, I guess my works purpose is to give 'nothing'. 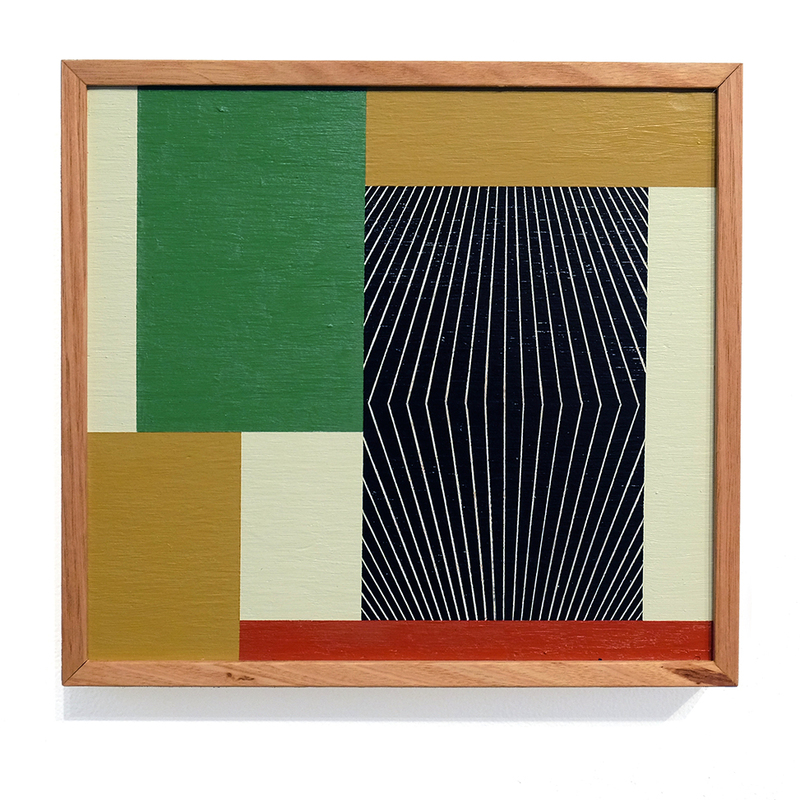 Organic, abstract, textured, and geometric. Who or what do you draw influence from? I am blessed to have so many talented friends that are my primary source of creative inspiration: AVSKE, CAIB, EXIT, SEIZ, BENJAMIN REEVE, CRUEL, BLEND, TUES. Outside of that, BRETT WHITELY was my first artistic love, KEITH HARING, ROTHKO, PUZLE. Currently I am really enjoying the work of REVOK, CLEON PETERSON, JOHN KAYE and TWO ONE. Artwork aside, my life is continually inspired by my wife and two beautiful children – without them, none of this would be possible. Outré Gallery presents 'Terra Oztralis' – a group art show looking above and beyond the Australian frontier. Exploring a uniquely Australian take on living and people, the exhibition features over 35 Australian artists. The impressive line up of Australian artists will share their interpretation of looking above and beyond the Australian frontier. There will be an array of original artworks in a variety of mediums, including paintings, collage, prints and sculpture. The show opens on October 5 and runs til October 16, 2018 at 249 Elizabeth street, Melbourne. Following incredible success as Australia’s largest female art show in 2017, Praise You is back for another year presented by UNE PIECE and Lusid Art, and proudly supporting The Butterfly Foundation, Australia’s national organisation for eating disorders and body image. Praise You illuminates the complex subject of women’s body image, self-confidence and female support in the creative community by empowering all elements of the female form through a specially selected group of national and international female artists. “Praise You is a homage to the women who have supported every step I’ve taken in my journey. It’s time to open up the conversation about women supporting each other’s creative and personal journeys,” says Alex Saba, Lusid Art / Praise You Curator. “We are passionate about fostering confidence and empowerment for women - and celebrating body positivity. I’m humbled by the generosity of the 24 talented female artists who are involved with Praise You. They have rallied behind us donating their precious time and work to contribute to much needed awareness of this cause and funds for the vital work that The Butterfly Foundation do,” says Carly Brown, UNE PIECE Founder. Showcasing pieces across several mediums and styles, including typography, illustration, and photography and wearable art, Praise You features over 20 nationally renowned artists including, Sophia Mary Mac, Ellen Porteus, Rach Pony Gold, Sarah Mccloskey and Rachel Burke. Final day: Saturday, 6 October 10-3pm. 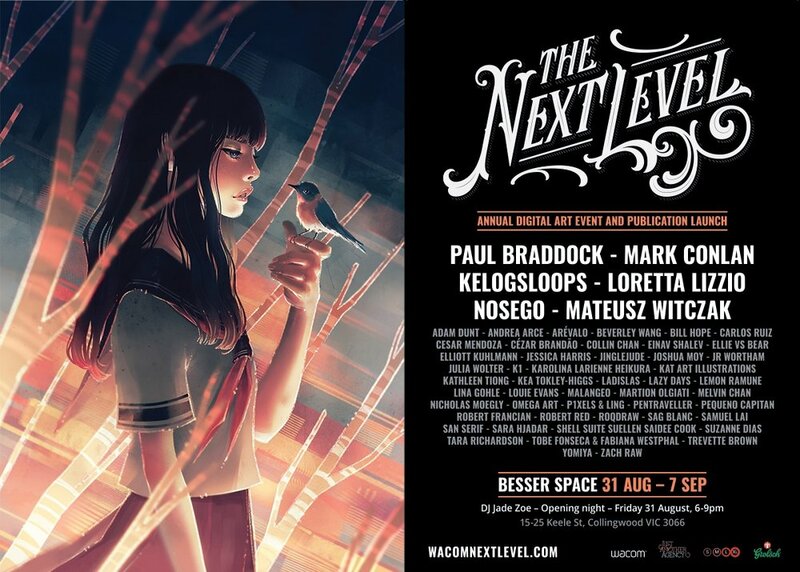 Head to the Besser Space this Friday August 31st from 6pm – 9pm to join in the celebration of incredible artwork, drinks and tunes from DJ Jade Zoe.